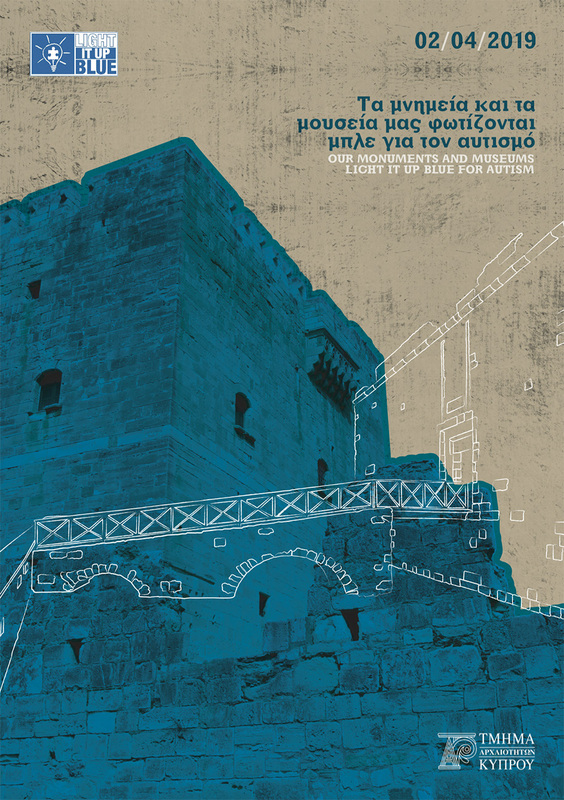 The Department of Antiquities, Cyprus announces that it will be once again be joining the organization Autism Speaks, on the occasion of International Autism Awareness Day and the Light it Up Blue worldwide campaign. On the 2nd of April therefore, important ancient monuments and museums in Cyprus will be lit up blue. As was the case in previous years, the Department of Antiquities will illuminate in blue the Cyprus Museum in Lefkosia, the Archaeological Museum of the Lemesos District, the Local Archaeological Museum of Marion-Arsinoe, the Castles of Kolossi, Pafos, Lemesos, and Larnaka, the Medieval Manor House at Kouklia, and the archaeological sites at Choirokoitia and Amathous. Through this endeavor, our monuments and museums, will unite with other important monuments worldwide, that will also be participating in the Light it Up Blue campaign. The campaign aims at raising global awareness and attention with regards to the idiosyncrasies and difficulties faced by persons in the Autism spectrum and their families. The need for securing access to care and support, continuous education, and the fundamental right for inclusion in all facets of life, is also highlighted. The vision of the Department of Antiquities, as reflected through its active participation in this important campaign, is that all citizens have a right to enjoy culture, since it belongs to society as a whole. Our cultural heritage is a vibrant nucleus of our society, and it is only through its protection that we will manage to preserve the values that are necessary for social cohesion, as they have been formed throughout the centuries. Our ancient monuments and museums, lit up in blue for Autism, will in essence transfer a message of hope for change and sustainable development, based on the love for human diversity which we should all share and care for!